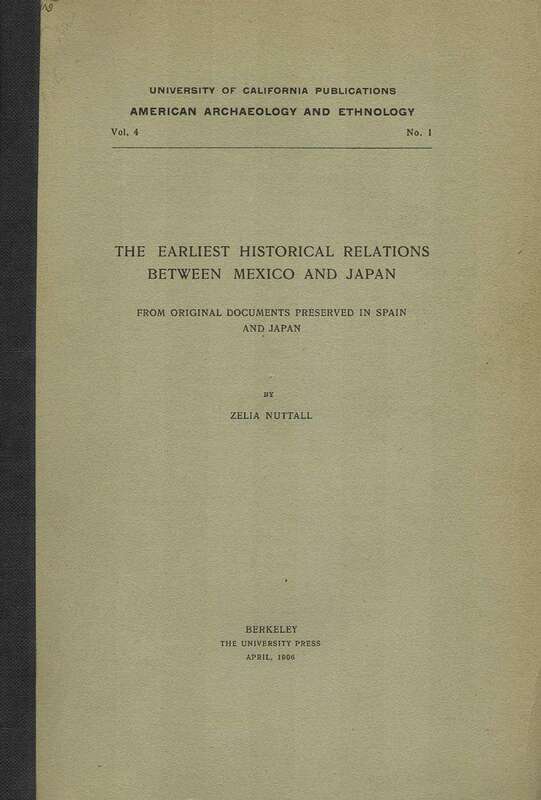 The Earliest Historical Relations Between Mexico and Japan, From Original Documents Preserved in Spain and Japan, published in Univeristy of California Publications, American Archaeology and Ethnology, Vol. 4, No. 1, April 1906, The University Press, Berkeley, California, 1906, 8vo, off-print with cardboard wraps, 47 pp. The author traces relations between Japan and Mexico (New Spain) from the 16th century through the early 17th century using documents found in Spain and Japan. Starting in the late 1590s Japan began cultivating trade relations with Mexico through the Spanish in Manila. By 1608 trading galleons moving between Manila and Acapulco regularly stopped at Uraga. By 1609 this preferred status was formally acknowledged in a letter dated November 2, 1609 from Tokugawa Iyeyasu's son, Hidedata which stated: "The vessels sailing from Luzon to New Spain may freely enter all ports in Japan and take shelter therein in any stormy weather." In 1610 twenty-three Japanese merchants were sent to Mexico aboard a Spanish ship. These merchants were headed by two noblemen, Tanaka Shosuke and Shuya Ryusai. They were returned the next year along with an embassy headed by Don Sebastian Viscaino dispatched by the Spanish viceroy in Mexico (Don Luis de Velasco the Second). General Viscaino was the son of the Spanish Viceroy in Mexico. The majority of the article discusses the activities of this embassy in Japan. The reciprocal embassy dispatched by Masumane, Lord of Oxo, is also discussed briefly. 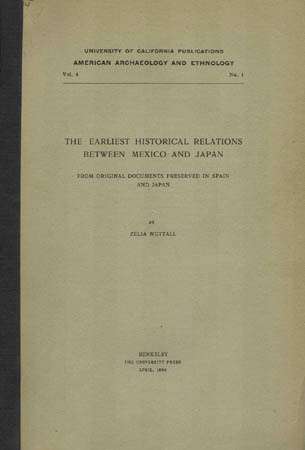 The author relied on a publication by Senor Ortega published in Mexico in 1879 and titled Historical Note on the Political and Commercial Relations Between Mexico and Japan in the XVIIth Century. He also relied on the detailed report by General Viscanio of the embassy to Japan which was contained in a document in Madrid which he describes as Volume VIII, "Collection of unedited documents relating to the discovery and conquest and organization of ancient Spanish possessions in America and Oceania." While not noted in this article several of the Japanese were baptized and Mexican accounts record that some never returned to Japan.